Christina of dosa guides us through dreamy Marfa. Different generations will think of Marfa, TX differently. For some, it will be the location of James Dean's last movie "Giant", or the location for Larry Clark's new film "Marfa Girl". If you are a modern art fan, Donald Judd would be the name that first comes to mind. Fashion designer Christina Kim is all about Marfa now. She guides us through Marfa to show us the reasons why. Acknowledging travel as the foundation of new creative ideas, dosa releases a clothing line called "Traveler" every fall. Why did she choose this small town in Texas as her next destination? It began when the shop Tienda M started selling dosa in 2010. 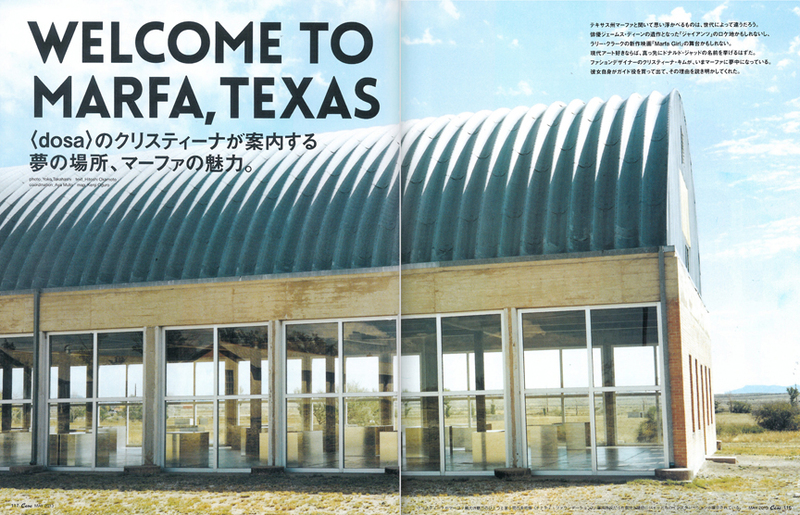 "After about 6 months, I decided to head out to Marfa. Marfa is a dream destination for people who love vast American landscapes, and a sacred place for people inspired by architecture and art, and I couldn't wait to get out there. 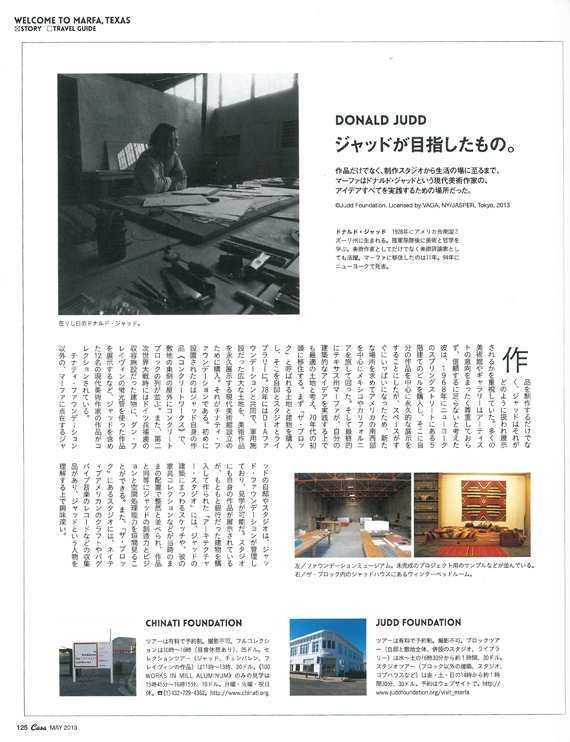 First and foremost, I wanted to see with my own eyes the world that charismatic artist Donald Judd had created. I have respected him since I was an art student, but I may not have understood him so well before I actually came here. What is most impressive is the boldness and the scale of his art." You may find Judd's body of work here and there in American museums, but Marfa stands out as the place where Judd moved from NYC to live, and his home and studios are here in town. In addition, Marfa is home to the Chinati Foundation where Judd's permanent installation is shown in a museum environment, according to his own ideals. We visited the Mill Aluminum with Christina, who has seen it many times. One hundred large aluminum boxes stand in neat rows inside the building that was once an army hangar. "I think light has a lot to do with this piece. The light coming from outside the window reflects onto the metal surface, and changes the metal boxes into something warm. Various images run through my mind and seem to open up many possibilities. My sense of time loosens up." Christina's new store Tienda M.
Christina was hard at work to further develop the space that originally connected her to Marfa. 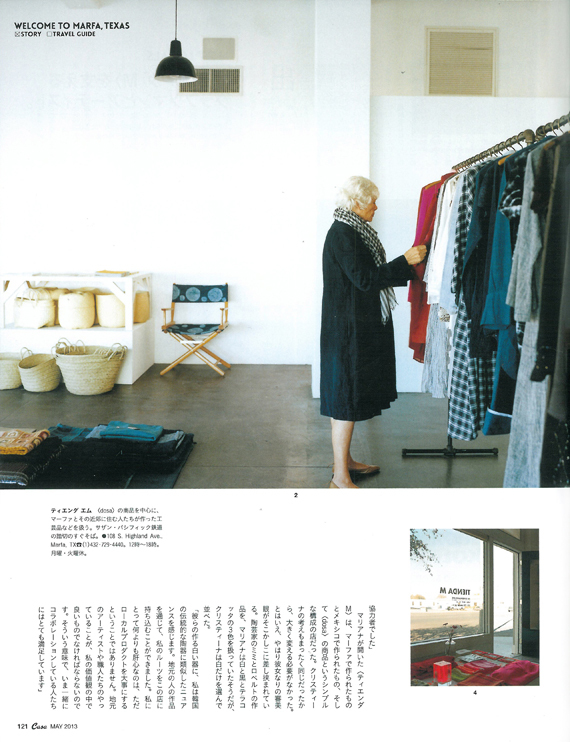 It was in July 2012 that Marianne Stockebrand, the founder of Tienda M, asked Christina to look after the shop. Two months later, Christina reopened the shop. She decided not to change the name. Marianne's Tienda M consisted of three simple elements: Mexican handicrafts, locally made goods, and dosa clothing. Christina's idea was very similar so there was no need to make a drastic change. However, her unique sense of beauty is present everywhere in the shop. Previously Roberto y Mimi's ceramic works were made in white, black, and terra cotta, but under Christina's new direction only white is available. "I see a nuance that resembles traditional Korean ceramics in their white works. Here I was able to bring in my roots, through local craftsmen's work. For me, it's not just about selecting local products. What the local craftsmen and artists do has to align with my own aesthetic values. In that sense, I'm very satisfied to be working with the people I am collaborating with in Marfa." How did the makers of products displayed at Tienda M meet Christina? What are they like and what are they thinking? Christina Kim met them in various ways. For example, one day she bought soap at the hotel shop she happened to stay at. When she took the soap to the room, the subtle fragrance made her feel at home, and soon she was tracking down the maker of it. 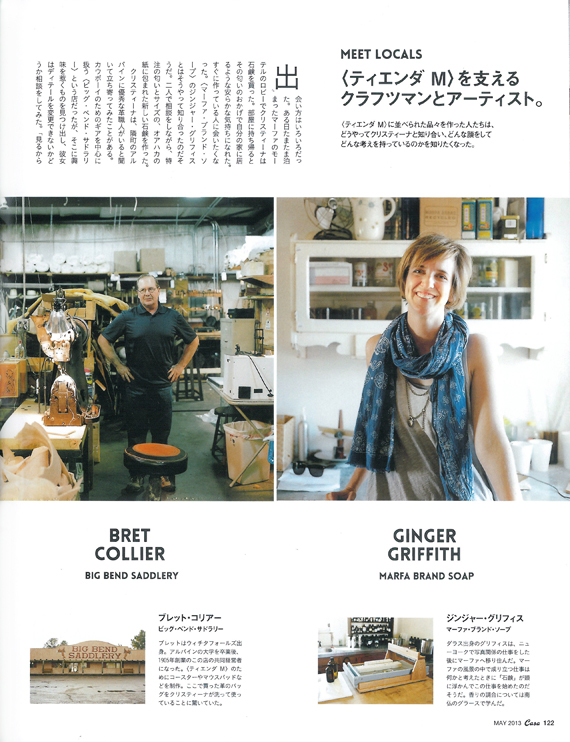 That is how she met Ginger Griffith of Marfa Brand Soap. After multiple conversations, they made a custom sized and scented soap that was wrapped in Oaxacan paper. When she heard there was an excellent leather craftsman in Alpine, the next town over, she made a point of stopping there. The shop was called Big Bend Saddlery, mainly dealing with leather goods for cowboys. Christina picked up a few items and asked if some of the details could be changed. "She's obviously a unique customer, and I'm always pleasantly surprised by her questions and ideas, and that allows me to come up with new ideas" said Bret Collier of Big Bend Saddlery. Also in Alpine are a couple of ceramicists, Mimi y Roberto. They have been making bowls and plates since the first phase of Tienda M for Marianne, and today Christina continues to work with them. 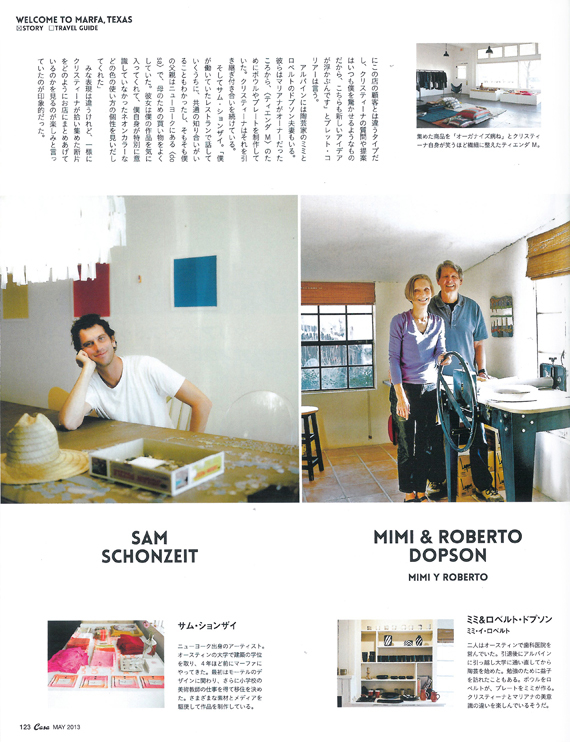 With Sam Schonzeit, it was like this: "While we were talking at the restaurant where I was working, we realized that we have a common acquaintance, and even before that, my father often visited dosa NY to buy gifts for my mother. Christina liked my work and had a keen interest in my use of fluorescent color that, up until then, I hadn't really paid much attention to." Everyone here works in different mediums and has a different approach, but they all indicated that they looked forward to seeing how Christina would arrange the pieces in Tienda M.
Born in Dallas, TX, Griffith moved to Marfa from NYC where she worked in the photo industry. When she thought about what work made sense in Marfa's landscape, soap came to mind. She learned scent blending in Grasse, France. Bret is from Wichita Falls, TX. After graduating from college in Alpine, he became co-owner of this shop founded in 1905. He makes leather coasters and mouse pads for Tienda M. He was surprised to see that Christina had washed a prototype leather bag that they were working on for a future dosa collection. After running a dental office in Austin, TX, the couple retired and took ceramic classes in Alpine. They visited Mashiko, Japan for research, too. Roberto makes bowls and Mimi makes plates. They enjoy the difference between Christina and Marianne’s aesthetics. Sam is an artist from NYC. Four years ago, he moved to Marfa after studying for a degree in architecture in Austin. His first project in town was designing a motel, but he decided to move here when he got a job as an art teacher at a local elementary school. He creates his work using a variety of materials and media. Marianne not only frequently appears in Christina’s story, but is also mentioned with reverence by every one of her collaborators. 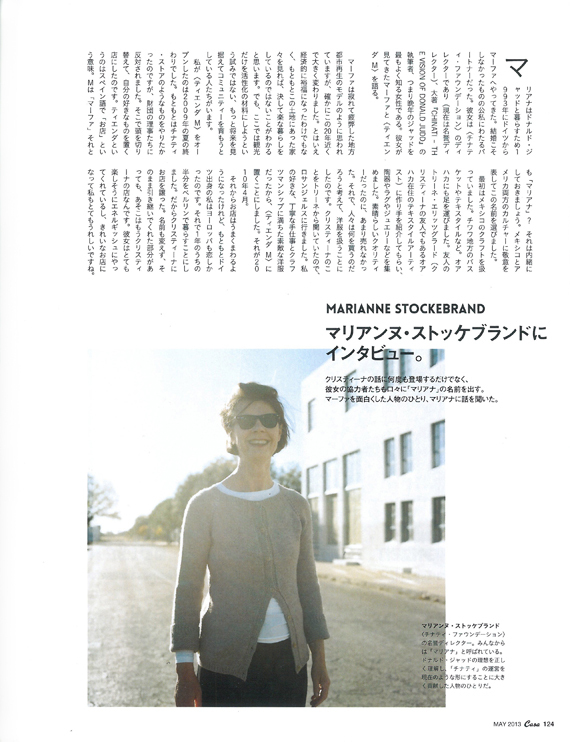 We had a chance to speak with Marianne, one of the people responsible for making Marfa such an interesting place. 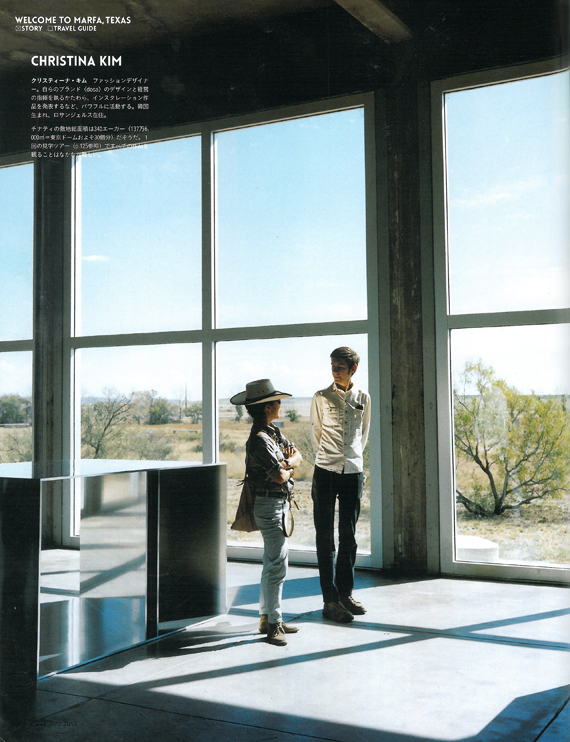 Marianne arrived in Marfa from Germany to live with Donald Judd in 1993. They did not marry, but they were partners in life and also professionally. Marianne was director of Chinati Foundation (now she is the honorary director) and the author of the bulky book CHINATI- The Vision of Donald Judd. Certainly, she is the person who knows most about Donald Judd in his later days. 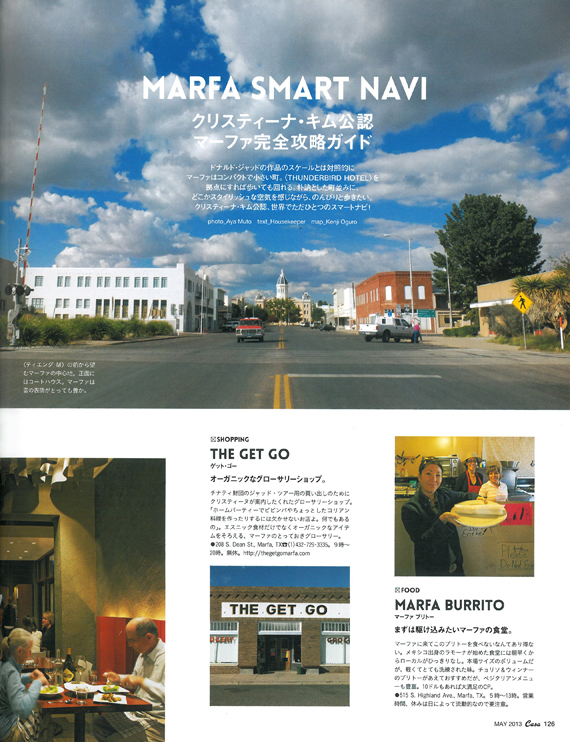 We asked about the Marfa that she saw, and about Tienda M.
“People see Marfa as a model of a revitalized suburban town, and in fact, it has changed a lot during the last twenty years. However that doesn’t mean that the town is economically well off. You can still see the humble homes built long before and know that the lives of many local people are not easy. One thing that makes Marfa special is the notion of community and the people who are willing to work toward it, with long distance visions of the future, not just an effort to materialize tourism as a means of revitalization. I opened Tienda M at the end of the summer in 2009. I initially wanted to make a Chinati store, but the board members of the foundation disapproved. I then switched gears and made a store of goods that I liked. Tienda means shop in Spanish. M is for Marfa, or Marianne? That I'll keep a secret. By choosing this name, I wanted to pay respect to both Mexican and American culture. In the early days, the shop was selling Mexican crafts: baskets and textiles from Chihuahua region and Oaxacan crafts too. I asked Trine Ellitsgaard (also a mutual friend of Christina's - she is a textile artist based in Oaxaca) to introduce me to the makers, and I found ceramics, rugs, and jewelry from Oaxaca. The quality was excellent, but they didn't sell well. I wondered what people would buy, and then decided to sell clothes. Trine told me about Christina so I flew to Los Angeles to see her work. I decided to carry the dosa clothing because the handwork is meticulous and they are beautiful, full of craftsmanship. It was April of 2010. Marfa became, not only a home for the final art work, but a place where Donald Judd created studios and living quarters - to live the ideas from day to day. Donald Judd was born in Missouri in 1928, moved to Marfa in 1971 and died in NY in 1994. After leaving the Army, he studied art and philosophy. In addition to being known as a visionary artist, he was also active as an art critic. Judd's practice did not end at the making of the artwork; he always paid close attention to how they were installed. He thought that many galleries and museums were not trustworthy, did not respect the intentions of the artists, and did not deserve his trust. So he purchased a five story building on Spring Street, NYC in 1968. The building housed mainly Judd's permanent pieces, but it did not take long for him to fill up the entire space. Judd then set out to find a larger location, travelling throughout the southwest of America, all the way to California and Mexico. Finally, he determined that Marfa, Texas was the optimal place to implement his architectural ideas, and moved there in the early 1970s. First he bought the land and the building called The Block and made them his living quarters, studio, and library. In 1978, Judd, along with the Dia Foundation, jointly purchased vast property that had been a military complex to establish a modern art museum in which his artwork and that of others would be permanently displayed. This became the Chinati Foundation. Judd’s own work, Concrete Works, was the first piece to be installed. A series of concrete block structures run in a line a kilometer in length on the east side of the property. In the long building that housed German war prisoners during WWII, Dan Flavin's fluorescent light pieces are installed along with collected artwork by twelve other modern artists, including Judd. Besides the Chinati Foundation, Judd's other studios and residence in Marfa are preserved and managed by the Judd Foundation, and open to the public by appointment. Judd’s works are exhibited in his studio, and his architectural sketches and collection of furniture are tidily installed as they originally were. Through these exhibitions, Judd’s creativity, visions and sense of spatial design can be observed and experienced. At the studio in The Block, Judd's personal collections are seen, including Native American crafts and bagpipe music LPs. All in all, these are interesting artifacts when attempting to understand Judd as a person. Tours require reservations. Photos are prohibited. For full collection, tours are $25 and from 10 am to 4 pm (includes a lunch break). Select tours covering only works by Judd, Chamberlain and Flavin are $20 and from 11 am to 1 pm. Tours for 100 Works in Mill Aluminum are $10 and from 3:45 to 4:15pm. Closed on Mondays, Tuesdays, and national holidays. Phone (1) 432 729 4362. In contrast to the scale of Judd's work, Marfa is an intimate and small town. 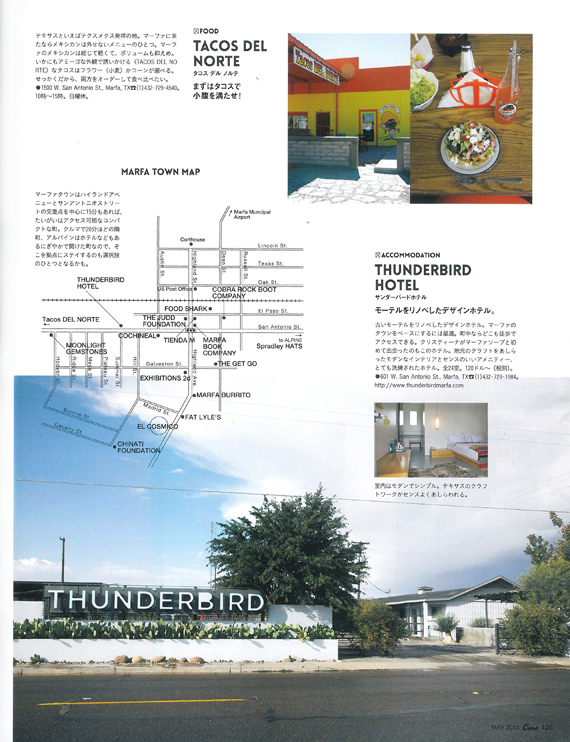 From the Thunderbird Hotel, you can pretty much walk everywhere. The older townscape is simple and quiet but has a stylish air and is perfect to stroll around. This is the one and only smart navigation authorized by Christina Kim. You can't visit Marfa without having this burrito. This diner was opened by Ramona from Mexico and her kitchen is always bustling with local people from early in the day. Her portions are large, but the taste is light with sophisticated flavors. The chorizo burrito is popular and recommended, but the menu also offers a variety of vegetarian food, too. You will be well fed for your $10. Christina took us here to pick up lunch for a Chinati Foundation tour. "If I wanted to make a Korean dish like bibim bap and other Asian foods for a house party, this is the place to shop! They have everything." Ethnic ingredients and organic items can be found here at this well curated grocery. Open everyday 9am to 10pm. 208 S. Dean St. Marfa TX (1) 432 739 3335. Jim is the image icon for many cowboys. The hats he makes are elegant just like the way he fastens his shirt up to the very first button. A hat takes about six months to make, but the refined textures and silhouettes are worth the wait! 2701B East Hwy. 90, Alpine, TX (1) 432 837 3061 Open Monday through Friday from 8am to 5:30pm or by reservation. It was almost shocking to encounter these sophisticated dishes in the middle of Texas. Tom at Etats-Unis, a popular restaurant in Manhattan, and Japanese chef Toshi moved to Marfa and opened this restaurant. Some guests dine here every night, looking forward to their Japanese influenced fusion cuisine. Date pudding is a must. Open everyday (except Wednesday) from 6pm to 10pm. 107 W. San Antonio St. Marfa, TX (1) 432 729 3300. A food truck eatery opened by Mark, who worked in the kitchen at the now defunct Miniature Rooster before it closed last year. "Their fried chicken is not to be missed. They are made with the Miniature Rooster's old recipe!" says Christina. Crispy and juicy fried chicken – really addictive. Open everyday (except Wednesday and Thursday) from 11am to 4pm. 719 S. Highland Ave. Marfa, TX (1) 432 295 2377. You can find them on Facebook. They make one classic original style here, with a 1940s “vintage cat paw heel”. From soles to shoelaces, Texas born Colt and Canadian Logan make everything by hand, one stitch at a time. Levi's “made here” selected their boots. The simple and earthy form goes with any style of clothes. From $450. Open everyday (except Monday and Tuesday) from 11am to 5pm. 107 S. Dean St. Marfa, TX. Among Texas agates, Marfa agates are especially known to hold a mystical power. Because many beautiful rocks are mined here in Marfa, the local people's respect for rocks and minerals seems profound. The owner of the shop started as a collector, then opened this shop. He sells crystals, natural agates, and also some jewelry. A mystical sense of the passage of time can be experienced in this shop. Open everyday (except Sunday) from 10am to 6pm. Fill your belly with tacos first! Texas is where Tex-Mex cuisine was born. In Marfa, Mexican food is overall a little lighter and has less volume than elsewhere. It is a must! You can choose corn or flour tortillas when you order tacos. Why don’t you order both and compare? The restaurant attracts people with its colorful and fun exterior. Open everyday (except Sunday) from 10am to 3pm. 1500 W. San Antonio St. Marfa, TX (1) 432 729 4540. Renovated from an old motel, this is the best place to stay when you want to stroll around Marfa’s town center. You can walk to almost everything from here. The modern interior features minimalist rooms decorated with local crafts and well selected amenities. This is where Christina found Marfa Soap. A good stay is guaranteed. 24 rooms from $120 (excluding tax). 601 W. San Antonio St. Marfa TX (1) 432 729 1984. Located just before the start of Judd's outdoor concrete block structure, El Cosmico offers vintage trailer lodging set on the vast open land. It is the best place to experience the Marfa landscape, they offer tent sites, as well as permanently installed tents. The trailers are all different models and sizes. Small kitchenettes are fully equipped with dishes and microwaves. Trailers are $110 – 150 per night (excluding tax). Tents are $65 per night (excluding tax). 802 S. Highland Ave. Marfa TX (1) 432 729 1950. The public space opposite of Tienda M is called “The Shade Structure” where Judd's tables and benches are randomly situated. The view is very much like Judd's sanctuary. The food truck drives in during lunch hour. Having lunch at Judd's bench and table is pretty dreamy. Red curry coconut ($9) is one of the most popular items on the menu. Open Tuesday through Friday from 11:30am to 3pm. "The owner Dennis Dickinson's curating skills are so cool - so focused and deep within a confined field." From works by well known modernists to a series of ironworks made by ranchers, all coexist in his space. The gallery is a renovated 1890’s farm house, but interpreted with the gallerist's unique touch, a true Marfa institution. Open everyday (except Monday and Tuesday) from 11am to 6pm. Reservations available. 400 S. Highland Ave. Marfa, TX (1) 432 729 1910. 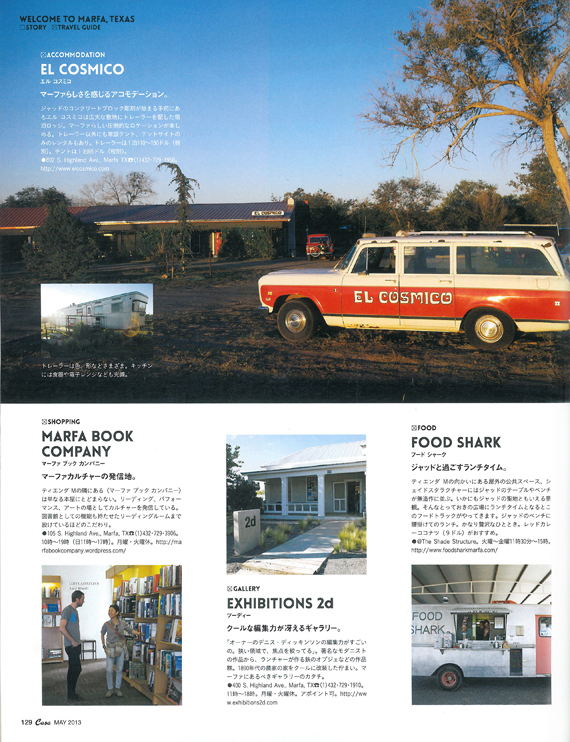 Marfa Book Company, next door to Tienda M, goes beyond the typical bookstore. Reading, performance, and art all come together here. There is an off site library reading room, as well. Open everyday (except Monday and Tuesday) from 10am to 7pm. On Sunday from 11am to 5pm. 105 S. Highland Ave. Marfa TX (1) 432 729 3906. One of the main attractions is the modern museum Chinati Foundation. An ex-military facility now houses installations by Judd and other artists. (Above) Christina loves riding a bike around town. The road runs through the Chinati Foundation. You can see Judd's Concrete Works in the background. (Right) At Saturday's farmers’ market, Christina exchanges information with an old cowboy who was selling eggs. Along with designing for and managing her company, dosa, Christina also thrives on creating installation pieces. Born in Korea, she is currently a resident of Los Angeles. Chinati Foundation is a 340 acre facility (fits approximately 30 Tokyo Domes). It is difficult to see all of the works exhibited here in just one tour. (Above) "I'd like to make this a reason for me to be here more often," Christina says about Tienda M. (Right) The gradation of color is beautiful. (Above) A mutual friend of Marianne and Christina's visits the store. "It makes a lot of sense for Marianne to seek out Christina as a potential owner." (Right) Fluorescent colored wallets are a collaboration with Sam Schonzeit. The shawls were inspired by Dan Flavin works seen at the Chinati Foundation. Marianne Stockebrand. Honorary director of Chinati Foundation. Everyone calls her "Mariana". She understood the ideals of Donald Judd and her efforts were a major contribution in making the Chinati Foundation what it is today. (Right) Foundation Museum and Judd’s unfinished prototypes. Judd's winter bedroom in The Block. (Above) This is Marfa's main intersection in front of Tienda M. In the center of the picture is a court house. Marfa often offers impressive cloud formations.